Play with others, build your confidence and forge ahead with our orchestral playing days! Did you learn to play an instrument when you were at school but haven’t got it out of the case for a long time? Or have you taken up playing an instrument in adult life just for fun? If the answer is YES then come along to our Blow the Dust off your Instrument playing day and rediscover the joy of playing as part of a group. This playing day will give you the chance to renew your old skills or put new-found ones into practice in a friendly, fun and relaxed atmosphere. The conductor will be Angela Kay, the Artistic Director of Music for Everyone, who blends expertise, enthusiasm and a great sense of humour. Membership is open to all and the instrumental parts will be sent out in advance of the course, to give you time to get to grips with the notes ahead of the day itself. The programme includes sessions for full orchestra, strings and windband. The principal conductors are Angela Kay, Gill Henshaw and Sheila Richards. 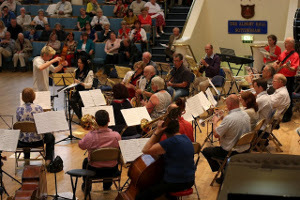 Saturday 6 July 2019 – Orchestral Playing Day, Albert Hall, Nottingham Booking now open – click here to find out more!